Welcome in the summertime with this Taste Safe Sandcastle Building activity from A Little Pinch of Perfect. Pop on your builder’s hat and enjoy this taste safe Builder’s Yard Small World. Enjoy the wonderful texture of this Sand Textured Cloud Dough from Sand in My Toes. This is a perfect base material for a small world. This is a fabulous Indoor Sensory Pond from Building Blocks and Acorns, perfect for enjoying water, colours and imaginary play. We love this beautiful, colourful Polka Dot Soup from Fun at Home with Kids. This super fun Taste Safe Sparkle Snow Dough from Bare Feet on the Dashboard would have any toddler digging in, ready to play! We love this colouful Simple Rice Play activity from Mama Papa Bubba. Scooping and pouring couldn’t be more fun. We loved this simple and (mostly) taste safe Autumn Sensory Discovery Bin although Buddy munched most if it! This is a beautifully bright and inviting Spring Time Sensory Bin from Learning and Exploring through Play. I want to play with it myself. Explore space, light and darkness and all those fun shapes with this Neon Space Sensory Bin from Adventures of Adam. 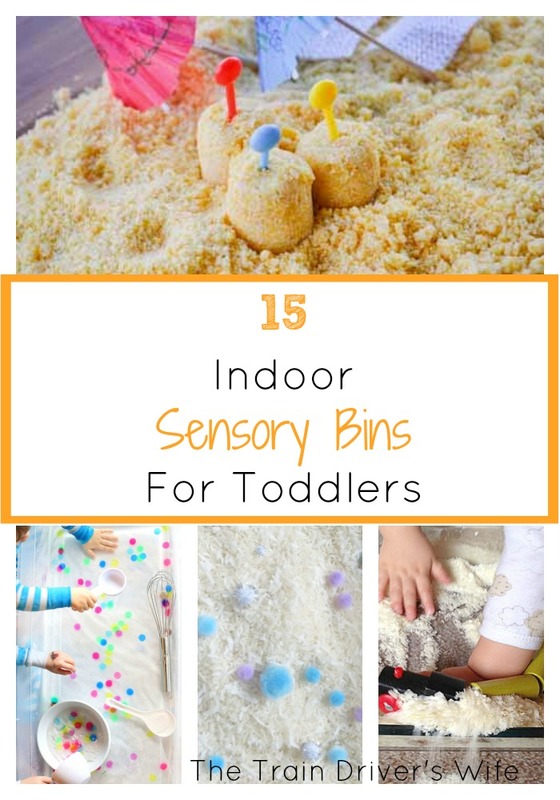 If you don’t have snow you can make your own with this Taste Safe Snow sensory bin. Why not throw in a favourite toy to make it even more engaging! Get your bucket and spade ready for this awesome Indoor Edible Sandbox from Hands on as we grow. We love the colours and textures in this beautiful Wintery Sensory Bin from My Mundane and Miraculous Life. Phew, after making all of these Buddy is sure to be exhausted! However, if those weren’t enough to sate your appetite for indoor activities, why not check out our 15 Indoor Arts and Crafts for Toddlers, 15 Indoor Fine Motor Activities for Toddlers and our 15 Gross Motor Activities for Toddlers and keep your eyes open for our 15 Indoor Simple Play Activities, which will be coming up later this week! Thanks for sharing our winter sensory bin! 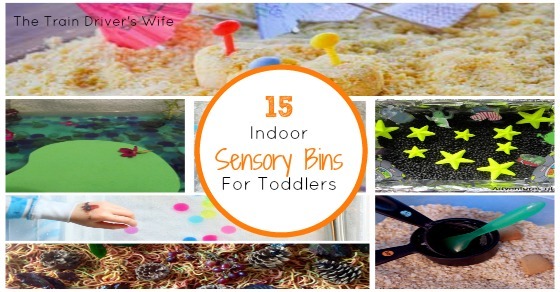 We love your spring sensory bin Amy! !